I don’t think there is another pizza as basic as a Margherita pizza which is only made with tomato sauce, cheese and basil. Who would think that a pizza so simple and apparently so bland would be one of the most popular pizzas? And without a doubt that is why it’s one of my favorite pizzas. I love pizzas that come with all kinds of toppings especially if they are made with beef or sausage, vegetables like peppers and mushrooms, and even a Hawaiian pizza that is made with ham and pineapple. 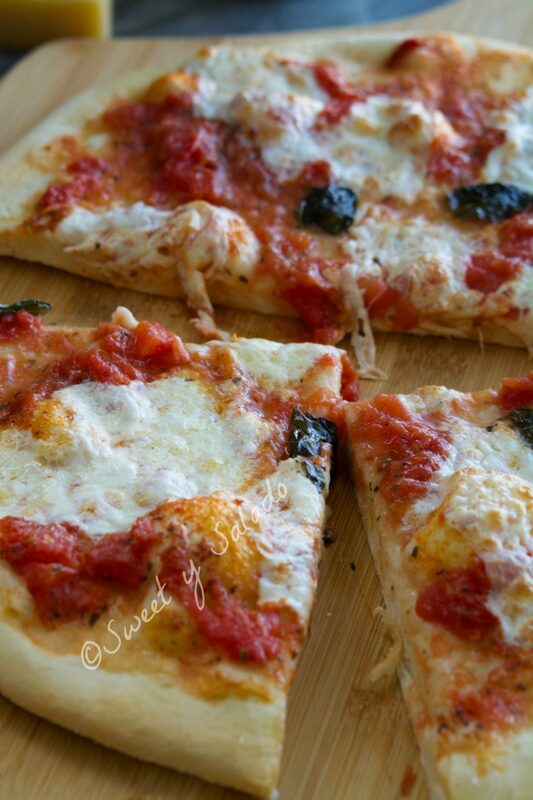 But if you give me a choice I will always go for a Margherita pizza. 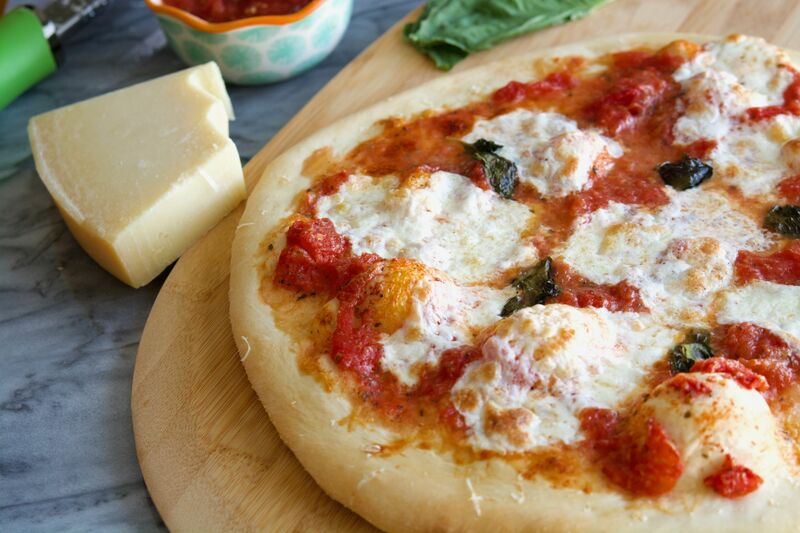 And not necessarily because it’s so basic, but because a good Margherita pizza will always be made with good quality fresh mozzarella cheese and fresh basil leaves, and those two ingredients are key so that every bite melts in your mouth. 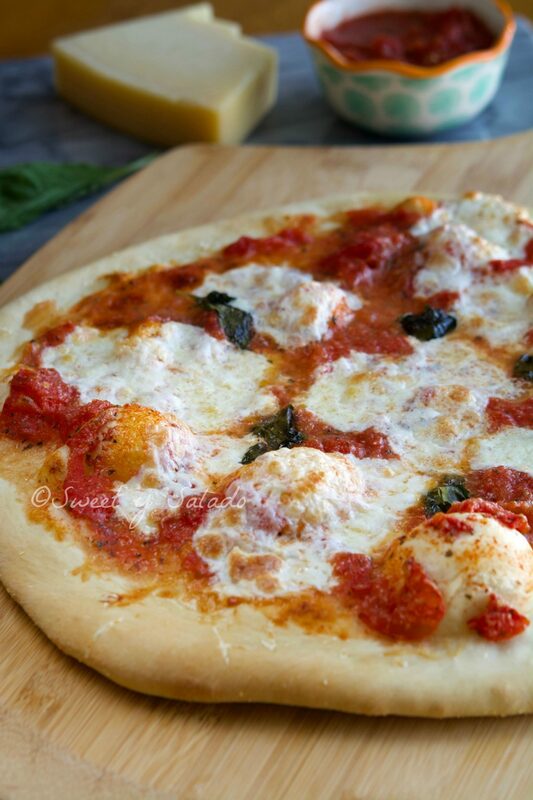 And of course you can find in my blog not only the recipe for making pizza dough (click here to see the recipe), which by the way, it’s really good, but you will also find two versions of pizza sauce (click here for the cooked version and here for the no cook version). Both are delicious and you can use them to make any kind of pizza that you want. Pre-heat oven to its max temperature, usually between 425°F - 500°F (220°C - 260°C). Place the dough on a flat floured surface (you can use either all purpose flour or cornmeal). Stretch the dough until you can form a 14 inch (35.5 cm) circle. Then, place it on a greased pizza pan. 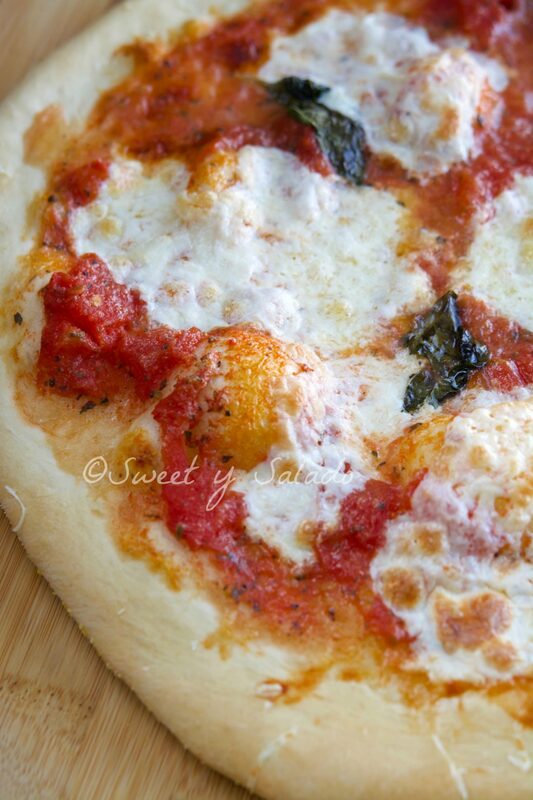 Spread the pizza sauce over the dough. Then place torn pieces of cheese over the dough. Place basil leaves on top. Finish by drizzling a little bit of olive oil over the pizza. Bake the pizza until the cheese melts and the edges begin to turn golden brown, about 10 minutes. Serve immediately. The amount of sauce, cheese, basil and olive oil is to taste, you can add as much or as little as you want.